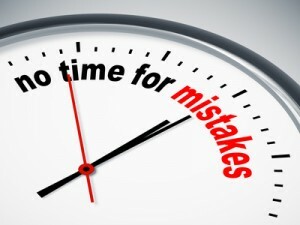 You are here: Home / Marketing and Business Development / Five Common Business Mistakes and How to Avoid Them. When a business is starting money is tight and the business must monitor their advertisement response and if it doesn’t work: STOP. The entrepreneur needs to be ruthless and evaluate each marketing campaign. There is a danger that the growing business, under pressure of making money, will end up in a loop, throwing more money at bad advertising. It is not the quality of the website that will get you the visitors and sales. It is the marketing of the website that will do that. Some businesses spend a large budget having their website designed but then spend almost nothing in money or time to promote the website. a) PPC – e.g. Google AdSense, Facebook etc. This is a common problem of start ups. The entrepreneur needs to attain certain levels of income by an unrealistic future time. There are enough pressures within a growing business from unforeseen problems without the need to add to them. In the UK 50% of new businesses fail in the first year and 90% do not reach the second year. Therefore this problem affects really good ideas that would otherwise have succeeded. c) Start the business part time. Online businesses lend themselves especially to starting part-time. 5) Not offering additional products to your customers. When you study successful businesses from small to large, they very rarely sell an item to the customer and never again have contact with them. The long term business profits are built by having a relationship with your existing customers. Offer a “back end” product to your customer, if you do not have such product, team up with another company that have it and offer it to your customer. The typical, traditional example on this topic is the hairdresser that offers his services and at the end sells shampoos and maintenance products.